Everyday I meet a woman, or a man who is frustrated with their hair. Their curly hair. They have tried every product. They have a closet full of creams, lotions, serums and sprays that had promised them manageable curls and all they delivered was a frizzy uncontrollable mess. Many of my customers resorted to chemical straightening – *a great alternative, when done in a Salon, by a stylist who is trained. Buyer beware of the “at home” straightening products – another tale for another time. The one thing all these customers have in common? Not one person, sales person or stylist had ever asked them what they were looking for from their product, how the envisioned their hair to be, what issues they were currently having with their hair, or even asking them what products they were currently using. You see, not all curl products are for all curl types. Yes, there are different curl types, from fine to thick, from wavy to corkscrew. Some corkscrew curls are fine, others are thick and coarse. Some have coarse wave mid shaft that gradually becomes a fine Botticelli style curl at the ends. Using the correct curl product for the curl type is key. There are many Professional Salon Curl products on the market. Today’s tale is focused on DevaCurl – in a word, Miraculous. This is a line that we brought into the shop over 3 months ago. Our owner/head stylist has curly hair, so she was our test subject. She understood the struggles and the frustrations of having curly hair. The results were outstanding. Soft, frizz free, shiny defined curls. The key to achieving these curls – using the DevaCurl Deva 3-step system. Now before you get all “I don’t have time for 3 more steps everyday!” – take a breath. Another. It takes all of 10 minutes. It is as easy as 1-2-3. It truly is. DevaCurl offers a 100% sulfate free, paraben free and silicone free shampoo – No Poo and conditioner – One Condition. *there will be no lather with the shampoo – sulfate free = no lather. No need to add more shampoo while cleansing – just add more water. The third step to the DevaCurl Deva 3-step system is the Light Defining Gel (for flexible styling/natural hold) or the Ultra Defining Gel(for ultimate curl retention/long lasting hold) – also 100% sulfate, paraben and silicone free. Step 2 – condition with One Condition and rinse. * a perk to this conditioner – it can be used as a leave in for extra hydration. Step 3 – apply the Light Defining Gel or Ultra Defining Gel. * for best results apply to wet hair. Yes. Wet hair. Tilt head forward and scrunch the gel into wet curls in an upwards motion. Then apply gel between your palms, emulsify and glide your palms over the hair. Flexible Hold Hair Spray – offers soft, touchable curls. Adds shine, helps curl retention and adds to all day conditioning. Set Up & Above – a pomade style product that offers maximum hold, texture and volume. Great styling control without a sticky mess. * Great results for short styles too – curly or straight. The DevaTowel – a microfiber towel that provides a smooth surface for curls – to set curls while keeping them defined and frizz free. The DevaCurl DevaFuser – meet your new best friend. Offers great volume and definition. This diffuser is a universal fit = fits most blow dryers. It offers 360 degree airflow = gently dries the hair from the inside and out for soft, frizz free curls. DevaCurl is a beautiful line for anyone who has curly hair – from loose waves to tight corkscrew curls. When applied properly, the curls are beautifully defined and frizz free – so much so, when you have seen the DevaCurl results, you can spot a DevaCurl curl in a crowd. It is a company that offers terrific support for it’s customers and clients – from styling techniques to cutting techniques. 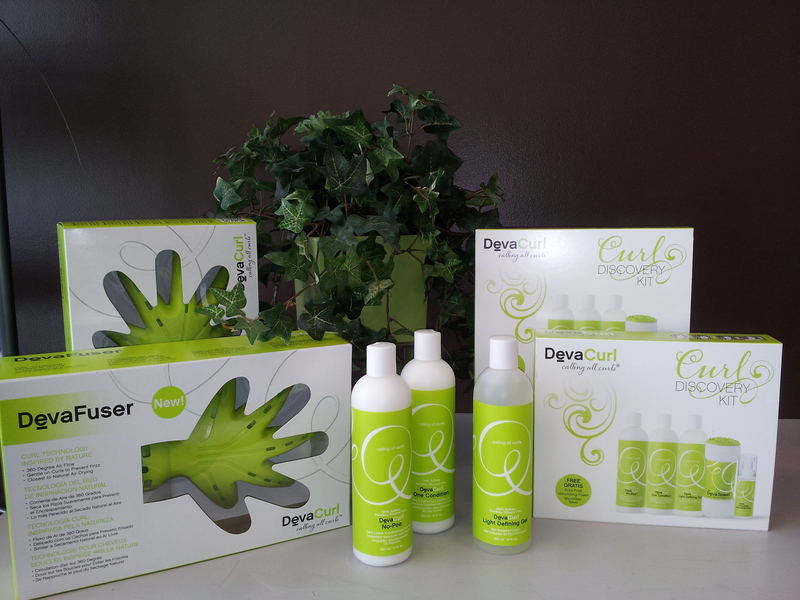 DevaCurl is a 100% sulfate, paraben and silicone free line, and is a cruelty free line – they do not test on animals. Once you have been “DevaCurled” as I like to call it – you will no longer envy your friend with straight hair, you will find yourself embracing your curls and smiling at your reflection, in the mirror, in the windows…where ever you may find it.